Religion is definitely a part of a culture. However, it is appropriate that religion have its own category and the culture category be reserved for all those aspects of the culture that are not religious. Duk Duk (pronounced Duke Duke). The male half of a secret society in the Gazelle Peninsula. The female half is known as Tumbuan. Women are not supposed to look at the Duk Duk. They appear once a year and today, are probably mostly displayed for tourists and cultural celebrations. Eye candy picture number 2,345,659. Note: The discussion below mixes the practices and religion of Polynesians and Melanesians. These two groups of people are different, nevertheless, there seems to be a lot of overlapping of their respective cultures. Therefore, I ask that the reader will understand this and forgive me if I have offended anyone. It was not done intentionally. For example, I know for a fact that cannibalism was practiced by both Polynesians and Melanesians, and that head-hunting was practiced by Melanesians, and that human sacrifice was practiced by Polynesians. But did the other group do the other thing too? I don't know. The religions of the pacific islands may be divided into three groups: (1) traditional religions (example: Tumbuan of Melanesia) before the advent of Europeans and missionaries, (2) the religion of Europeans - namely Christianity, and (3) some mix of the two involving not only religion but the adoption of western culture into a new religious expression (example: Cargo Cult, John Frum, Holy Mama of New Georgia, etc.). Melanesians and Polynesians were either cannibals or head hunters, but not both, I once read, but I don't know if that's true. But it is likely why Charles Darwin is reported to have said, "Any person shipwrecked on a South Pacific island had better pray that the message of the missionary has preceded him." It was a very dangerous part of the word for visitors, not to mention for the inhabitants as well. One island chief boasted of having eaten more than 200 victims in his lifetime; and they even had special "sacred" utensils for the purpose of the awful feasts. Look on the internet for "cannibal forks". Human sacrifice was common in the Pacific as well as intolerance for sickness and deformities. Those who unfortunately did not recover from wounds or sickness were sometimes buried alive or murdered. Women were routinely murdered to accompany their dead husbands to the grave; and simple, even accidental affronts, were sometimes met with instant death - and that included children. Burying people alive was common for several reasons, one being to insure the foundation of sacred temples to their angry war-like gods. 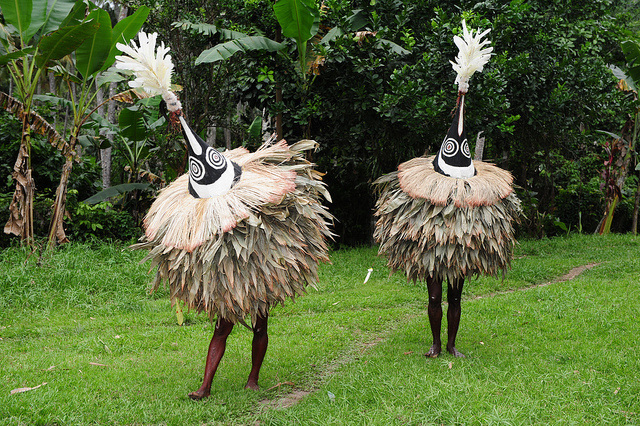 Historically, Melanesians are animists: a person who believes spirits inhabit everything. The belief may be summed up thus - "All natural phenomena have souls independent of their physical being," and "All life is produced by a spiritual force separate from matter,"(Webster's New World Dictionary, Second College Edition). It may be why blindness from drinking denatured alcohol was blamed on a spirit or a curse instead of chemistry; or why cargo that arrived after filling out a request form was attributed to the paper and the act of writing instead of the whole infrastructure and organization that lies behind the form; or why sickness is attributed to curses, or why a death is attributed to the call of a jungle bird. And it may be why a native head-man taken abroad to see the construction of modern things came back saying, yes he did see how things were made, but the white man still did not reveal his magic. The idealism and romance of the south seas inferred by popular culture and movies mostly did not exist long ago. To be sure, the South Pacific is the world's source of eye candy but the beauty of the places did not translate into happiness and peace for many before the advent of Christianity. Eventually Christianity (and with it education) came to the islands and many of the degrading and brutal practices of the past stopped because of it ... albeit slowly (even today some islanders mix old superstitions with Christianity). Missionaries came from Europe, America and even other South Pacific islands: Spanish, German, French and Irish Catholics, Methodists from Samoa, Congregationalists in the London Missionary Society, Anglicans, Lutherans, Baptists, Pentecostals, Seventh Day Adventists and many more. And some of them paid the ultimate price for their devotion. A few missionary's went mad, some went native, some left because of the dangers, some were martyred, but many stayed. Their monuments and early graves are spread across the islands. Some, however, like a few in Hawaii, exploited the natives by mixing western culture with faith (a dangerous mixture), but over all, degrading practices were set aside for a more inclusive and peaceful existence. Regardless of your viewpoint, no one can deny that it was a bumpy road for the purveyors of the new religion and their converts. Most missionaries are today very sensitive to cultural practices or viewpoints and tread lightly. But unfortunately, the cultural destruction has not stopped. It is continuing in the best tradition of the whalers and black-birders of yesteryear - being adopted by the freedom of expression gang. Robbing of banks and buses is learned through western "art forms" such as movies; and the formally almost sacred place occupied by elders for cultural and societal cohesiveness is being torn apart through another "art form" such as TV programs like The Jerry Springer Show where guests illustrate just how low on the ladder degenerate humanity can devolve to. Given enough time by these fame and money-hungry media elitists, the islanders may once again get to regress back to the dark practices of old where fear ruled. 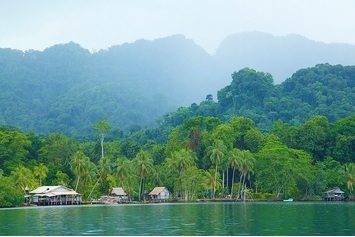 Nevertheless, the islander perhaps remains the most religiously devout person on earth. In some places whole villages "belong" to one church which has become the center of social life as well as faith. I apologize to all historians who know much more about this subject than I do. The map above is a gross over-simplification. It was not easy to build a simple visual that depicted the history of missions in the Pacific Ocean, so I tried to show only those missions that were first. Therefore, it does not give credit to those missions which arrived shortly after the ones shown in the map; and in some cases an islander would introduce Christianity to another island but not stay to establish a presence. These, while first, are not represented here either. Two abbreviations need definitions: ABCFM = American Board of Commissioners for Foreign Missions, and LMS = London Missionary Society. The colored symbols represent the religion of the first missions and the dates when those missions were begun. The colored lines represent the general route taken by the missionaries to establish those missions. The names of those missionaries are in black above each line. The legend table also shows the names of those missionaries and where they came from. In some cases I could not find out how a missionary got to where he ended up. For example the first LMS missionary to Tahiti, Henry Nott, sailed on the missionary ship Duff and the path it took was from England around the Cape of Good Hope, south of Australia and New Zealand and up to Tahiti. However, I could not find out how the first LMS missionary, John Jones got to the Loyalty Islands in 1854, so I could not draw any line. Finally a word about accuracy: I don't guarantee it. How could I when different "authoritative" sources gave different dates and information? 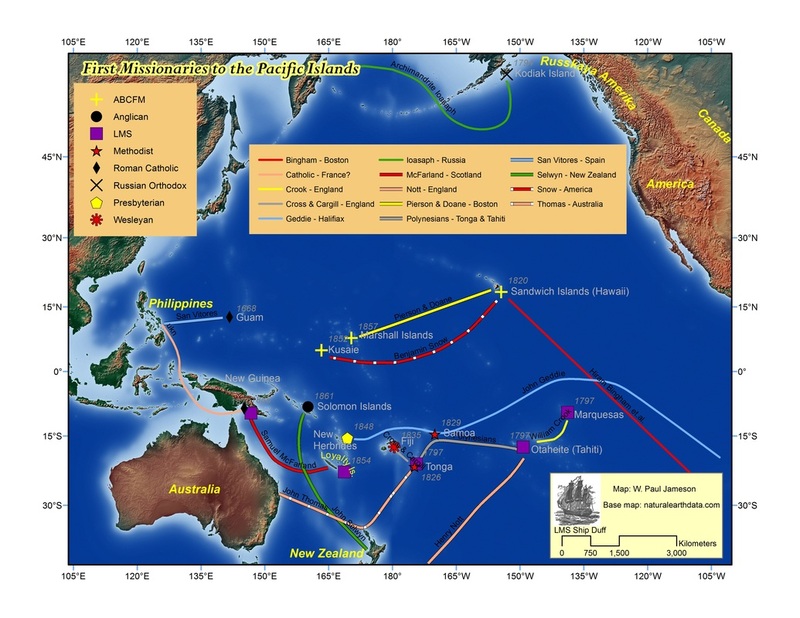 But I think what you see above is a fairly good representation of the history of the first missions in the Pacific Ocean. Reconciliation is the fruit of Respect.